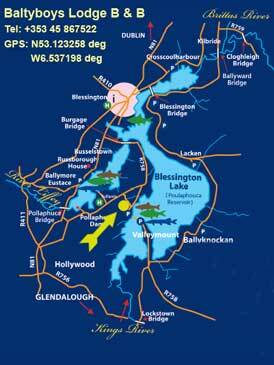 Baltyboys Lodge is located 8km from Blessington town on the R758, it overlooks the beautiful Blessington Lakes & Wicklow hills and is surrounded by farmland. The lakes boast of good fishing while there are also amenities for sailing, kayaking & windsurfing and Lake Boat tours Available. There are 2 golf courses within 2km of our home, 'Tulfarris golf club' a championship 18 hole course & 'Boystown golf course' a challenging 9 hole. There is also a pitch & putt course close by. Glendalough is 25km from our home, a must visit when in Wicklow, with St Kevins monastic settlement site & the wonderful & magical walks around the upper lake. There are numerous wonderful gardens to visit, such as Powerscourt, Mount Usher & Kilrudderey House and gardens to name but a few, all of which can by accessed by the very scenic Wicklow or Sally gap route. Punchestown racecourse is 10km, while we are 40 km from Dublin airport & Dublin port. Our home consists of 3 guest rooms, 1 family & 2 double all en-suite with power showers. 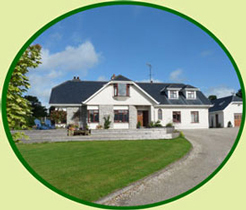 A large guest lounge where guests can enjoy tea, coffee & home baking on arrival, a dining room with a communal breakfast table where you can linger over a made to order breakfast from our extensive menu which would include, freshly squeezed juice, home made muesli with wild Wicklow honey, freshly baked breads & our own free range eggs, scrambled with smoked salmon or 'just how you like them' with a full Irish breakfast & more.